It should go without saying that wild animals are not props for selfies. According to a recent Associated Press report, a controversy is brewing over the proliferation of wildlife selfies and the growing trend of Amazon “selfie safaris." In many places throughout the region, hundreds of animals are being held captive, having been taken from the jungle, in order to create attractions where visitors can see multiple local species at once. 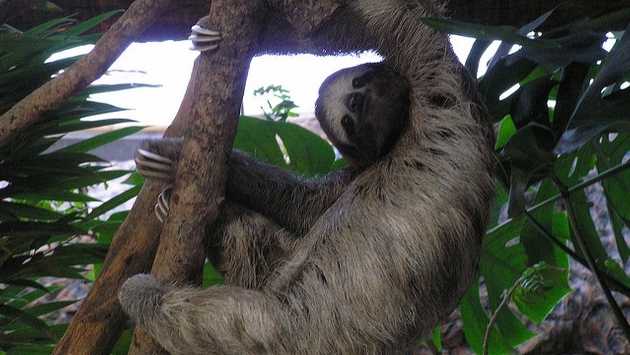 The advocacy group World Animal Protection recently issued a report stating that animals, such as sloths, suffer when they’re kept in captivity for tourists to hold and photograph. In an interview with the Associated Press, World Animal Protection global wildlife adviser Neil D’Cruze said wildlife selfies involve significant animal suffering: “We want tourists visiting the Amazon to know that if they care about wildlife, they should not use animals as photo props on their vacation." The animals being presented to tourists have most often been taken from their natural habitats and are kept in unsuitable conditions. They are also then handled by countless visitors every day, causing stress and injury to the animal. It's vital that travelers be educated about the harm they’re doing, D’Cruze said. He also applauded Instagram's’s bold step of issuing animal selfie warnings. TripAdvisor has also stepped into the fray. Since 2016 the site has stopped bookings for attractions that allow tourists to come into physical contact with captive or wild animals, according to Associated Press. Rather than visiting an animal that's being held captive, book a stay at a jungle lodge where it's possible to see them in their natural environment, suggests D’Cruze and others. The practice of showcasing captured animals for tourists persists in places such as Puerto Alegria, Peru, according to a National Geographic reporter who recently traveled to the Amazon to confirm World Animal Protection’s claims and conduct an exclusive investigation. The reporter, Natasha Daly, said she saw 20 species brought out for tourists over the course of three days. The publication’s resulting coverage described the Amazon as the new frontier of a deadly wildlife tourism that involves widespread animal suffering fueled by these selfie safaris. “Every day hundreds of tourists, mostly from the Colombian side of the river, arrive by boat, walk up wooden planks from the water to the shore, and clamor to hold and take photos with as many as a hundred captive wild animals of two dozen species,” wrote Daly about what she witnessed while visiting Puerto Alegria. The Peru example is just one of many such attractions. They also exist in Colombia and Brazil. Like D’Cruze, Daly suggests tourists who truly want to see animals should stay in the region for awhile in a local lodge and go on a jungle safari. It’s an option that takes more time and money, something many visitors do not have. Educating consumers about these issues, however, may impact their choices, particularly among animal lovers who may not understand the harm being done. “As soon as an activity crosses the line from observation to interaction, it’s probably going to be bad for the animal,” she said.